For information on Colic and Crying click here. 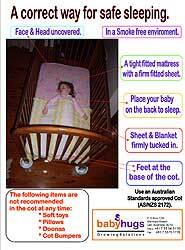 Click here to read or print the Cot Safety Fact Sheet. If you feel you are losing control with a crying baby, call a friend, neighbour or family member to come help. There is no shame in tired parents asking for help. A crying baby can be harrowing. Click here to read or print the Stability Test.